We are getting ready to say goodbye to our flowers for the season. In our area, flowers disappear with the first frost. Although a little early, we lost a few vines this past week, but we are still enjoying the flowers. However, I understand that we must enjoy them today because they will be gone tomorrow. 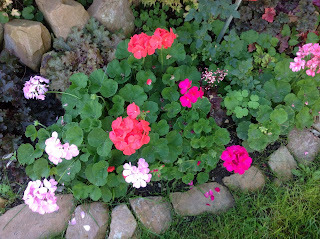 I was looking at my geraniums and thinking how different each plant can be. Not only are the colors of the flowers different, the leaves and the plant patterns vary from mound to mound. It is like having different children in our classrooms. If we are working with 5 year olds, they are all 5 year-olds. Fortunately, they all have different patterns, different leaves, and variegated colors. Like all of my geraniums, children need different things to flourish and make the most of their development and accomplishments. 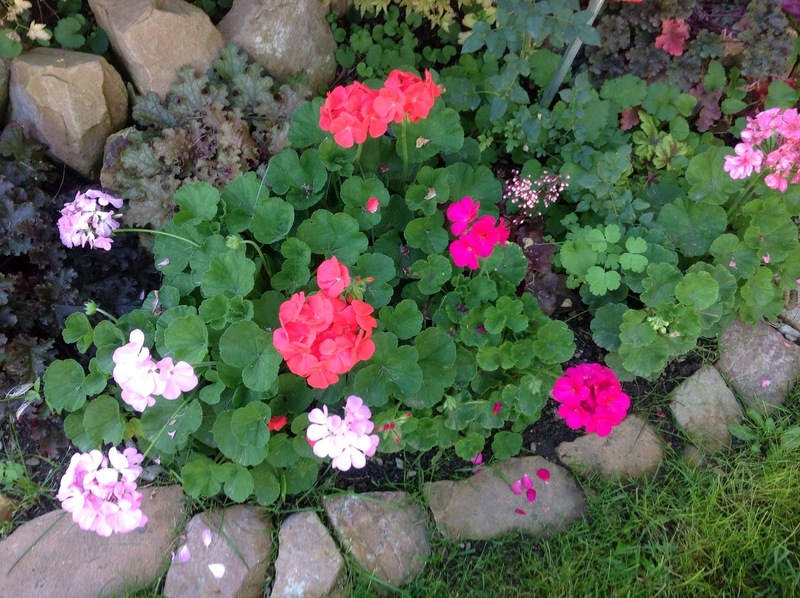 I had a geranium this season that needed constant monitoring with additional plant food and water. Because I took the time to do this, that plant did well and provided many beautiful blooms during the summer. Other plants seemed to grow like weeds, without much additional care. The children in our classrooms are so much like that. Some need extra care and consideration to make the same progress other children seem to make automatically. The key is to provide that extra nourishment. Children who need extra care are sometimes the ones that fight it and seem to rebuff that extra attention. That means we teachers must make it a priority to provide the necessary care. If the child is going to bloom, we must be willing to provide the necessary support. As early childhood community, we need to work to make sure every child blooms. Your analogy is worth considering, and I would take it a step further: the plants have many differences on the surface ... yet when we look more deeply into their fundamental make-up differences are indiscernible. The same holds true with 5 year olds: many differences on the surface (personality, preferences, constitution, etc. ), but deep down their fundamental feelings are quite similar. The thing is, we can't tell them that and be very effective with improving their behavior, BUT we can help them to consider different points of view by asking them intelligent, open-ended questions that respect their hearts and minds. Questions are the key to lighting the creative spark that empathizes, problem solves, relates, collaborates - naturally and without force. Early childhood education refers to the formal teaching of young children by people outside the family or in settings outside the home. "Early childhood" is usually defined as before the age of normal schooling five years in most nations, though the U.S. National Association for the Education of Young Children defines "early childhood" as before the age of eight. millionaire AdSense make money tip has to do with content because the AdSense program is designed for content rich sites and the chances of clicks increases dramatically the more the pages that are available of valuable content served with relevant AdSense ads. Never take this Millionaire AdSense make money tip lightly. Early childhood education refers to the formal teaching of young children by people outside the family or in settings outside the home. nice information that you have just share with us ireally like this. The difference is, we can't tell them that and be very effective with improving their behavior, BUT we can help them to consider different points of view by asking them intelligent, open-ended questions that respect their hearts and minds. thanks for sharing with us superb information. It is usually an web online marketing technique, known as nuclear affiliate which has definitely become one of the most well-known methods to earn money online nowadays due to its pleasure. If you do not already know, online marketing is the marketing of items or alternatives online for other web organizations or organizations and developing create up for every buy or cause that you generate. This is true that the currently have a kid who is in nurture proper care in their category. The little first grader is familiar with how to control circumstances and will not work with educational setting rules. It is really true that the blooming period of a child is his early childhood. The things he learned in that period of time, pasted in his mid forever. is a way to produce viable and sustainable earnings in Online Promotion, The very first thing you need to figure out is what products or services you want to promote or sell. There are some types of generate money. The first is Pay-Per-Click is a highly marketed and used affiliate marketing technique by associates with sites or small sites. Beginning child years knowledge represents the official training of kids by people outside family members members or in configurations outside the home.thanks for sharing this information with us. I loved the analogy you have presented here! I never thought of it this way. I have tried to keep flowers growing as I do with students but realize how different they can all be. Flowers are all different even if they are the same just like our students. I love this post! I love the analogy here. I agree that all students are different just like flowers. I have never thought to approach students that way; it helps to make sense of why students behave the way they do. I agree that the needs of each child are important, like the needs of each flower are important, and some children (like flowers) need more care and consideration. Thank you for this post! This was a great analogy and a different outlook on children. I agree that not all children are the same in the way they grow and learn and that it is very important to acknowledge this and figure out ways to address it. What are your suggestions in doing so without making other students feel that they are less important? We really need to take care of our children and nourish them in their childhood years and continue educating them as they grow older for them to become a better person. That is a nice suggestion of a topic to talk about as regards to masters in early childhood education online . Thanks. HCS 405 Week 2 provider. This is a numerous weblog and real flexible too. Excellent task. Awesome believed you discuss it outstanding keep it up.The guidance that offered is real able-bodied bookkeeping and useful. Thank you for control awesome information. Good blog . Lots of great information and inspiration, both of which we all need. Thanks. Great Article,Very Informative.Keep up the good work. Incredible post and very educative. The topic of this post is extremely exceptional. This is a very nice content for the readers and the affiliates in early childhood education. We are living in the world of education and thus all matters of education cannot be overlooked. This is why Literature Review Rewriters have also seen the need to help the scholars in the institutions of higher learning with their literature review content for their research papers. The small kids should pay equal amount of attention to all subjects but personally I think studying theory is more challenging for them in comparison to practically exploring things. If you are struggling finding such activities then you must have a look at http://www.kidsfront.com/english/1.correctsentence.html. The post is so incredible and interesting. Hi! I just found your blog. I love the way you have presented your content! Great idea! Thanks for sharing.